Are you among the one in a million people who believe that going to school would be something you’d like to do on your day off from work when you’re supposed to be having fun or relaxing? NYRA, in conjunction with America’s Best Racing – an initiative of The Jockey Club, announced it will be hosting classes at Saratoga Racecourse to help newcomers through the maze of the sport on six days this meet, beginning Saturday, the day of the Grade I, $750,000 Whitney Invitational Handicap. 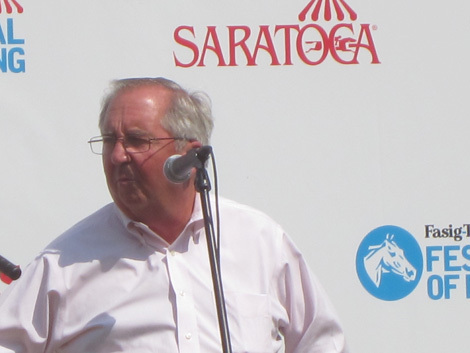 Shug McGaughey, trainer of Stuart S. Janney, III's Hymn Book in Saturday's Whitney Handicap, answers questions at the draw. Sometimes marketing is counter-intuitive. The racetracks would benefit more by stressing that people could win without knowing a thing and that a day at the races would still reward them with an exciting, enjoyable and affordable experience if they didn’t. “We recognize that thoroughbred racing is a complex sport and can be intimidating to the casual fan and first-time patron,” said NYRA President and COO Ellen McClain defensively, in a press release. McClain, by the way, heretofore a bit of a phantom, showed up at the post position draw for the Whitney that was held in the paddock before racing began. Nevertheless, no matter how hard the sport tries, it’s tough to make assigning positions in a starting gate interesting. Speaking of making things interesting, few horses that finish last in a $20,000 claiming race receive as big a hand as Stay Composed in the seventh. The filly dumped jockey Wilmer Garcia at the break, continued running without him, and was caught by an outrider who entered the race in a meaningless dash through the stretch. 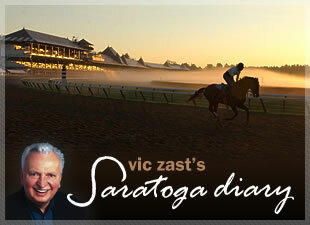 A new Saratoga Grandstand Craft Beer Garden has opened to the side of The Carousel. You can buy a 12 fl.oz. beer – a tasty one you’ve never heard of before - for $5. “They’re getting to learn that we’re here,” said a barmaid. If you really love the suds, follow the crowd to Druthers on Broadway, the beer garden and brewery that held its grand opening Wednesday. 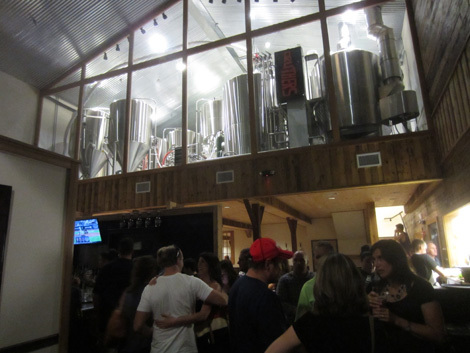 Beers here cost a little more, but they’re made right under your noses, and you get 20 fl. oz. for $6. “They sent us the wrong glasses,” shrugged Brian Martell, one of the owners as he went with the flow. Another new hot spot opens on Broadway. Druthers brews its own beer. Druthers wasn’t the only place open for evening fun. Saratoga Hospital held its annual fund-raising party in a tent behind Siro’s Trattoria. The Philadelphia Orchestra, a day after emerging from bankruptcy, opened its three-week SPAC season. Attired in the full Cleveland, author William Kennedy drew close to 1000 people at the Canfield Casino for an hour of unsatisfying rambling. The Pulitzer Prize winner began with stories about John “Old Smoke” Morrissey, a disreputable man after whom the day’s feature race was named. A 6-year-old gelding named Saginaw, making his twenty-ninth start, won the $100,000 stakes. 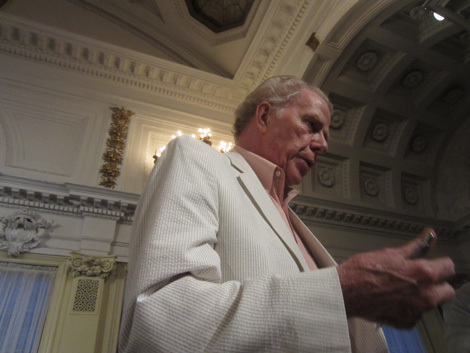 William Kennedy unknowingly chose to talk about John Morrisssey, after whom the day's feature race was named, in his presentation at the Canfield Casino. Homeowners on 5th Avenue can tell that the yearlings have arrived at the Fasig-Tipton barns. Their neighing at dawn is an alarm clock.